Long long ago, an asura king named Mahabali was ruling some parts of the present Kerala. He was very wise, powerful and a judicious king who loved his people. Soon his popularity and rule spread over many more places, but when he extended his rule to heavens, the Gods felt challenged and began to fear his growing powers. Fearing that Mahabali might soon become over-powerful, the Devas pleaded to Lord Vishnu to control the growth and power of Mahabali. Lord Vishnu transfored himself into a dwarf brahmin called Vamana and approached Mahabali and asked for alms. Pleased with the dwarf brahmin, Mahabali granted him a wish. Immediately, Vamana asked for some land that he covers with his three steps. The King, not knowing about Lord Vishnu disguised as Vamana, agreed to this. Lord Vishnu then increased his stature and with the first step covered the sky and with the second step he covered the heaven. Realising that the Vamana's third step would destroy the earth, King Mahabali offered his head for the last step. Now when Lord Vishnu kept his third step over Mahabali's head, he was pushed inside the earth. Before banishing him into the underworld, Lord Vishnu granted him a boon. Since he was attached to his kingdom and the people, he would return once a year from exile. And that time will be celebrated as Onam. Thus the people of Kerala celebrate Onam every year to mark the homecoming of their king Mahabali. Onam is celebrated in the remembrance of above story. In this year 2014 Onam is celebrated on first week of September. So there are many Onam Malayalam greetings to share. Interesting article! Its quite amazing to know that there are so many interesting stories of God Vishnu's avatar that many are not aware of. Adding one more story of God Vishnu's avatar. 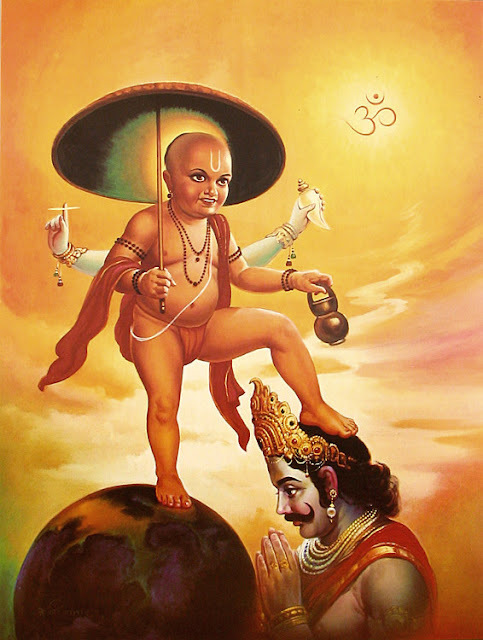 Vamana Avatar, the fifth avatar of God Vishnu came to earth in the form of a dwarf Brahmin to subdue the Demon King Mahabali. This is a very interesting story! I like to discover other cultures and to get useful information from their folklore stories. Nowadays people more often stop to believe in god or gods and such ancient stories are not very interesting for them. This different opinions will help you to make your own opinion about other cultures.